Jo Jingles offers fun music & movement sessions with an educational slant for babies, toddlers and pre-school children aged 3 months - 5 years. 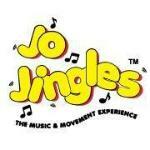 Jo Jingles is a carefully planned activity with age specific classes. During each class, educational themes are introduced through actions songs, nursery rhymes, percussion instruments playing and story time.